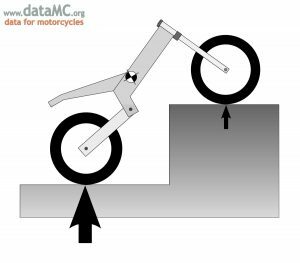 To better understand the motorcycle’s suspension and how to interpret suspension data to improve setup, it’s helpful to look at weight and the center of gravity, and how much load is on the suspension as the bike turns, brakes and accelerates. With GPS data, it’s possible to put values to the acceleration parameters, and from there calculate how much weight is transferred and to which wheel, and the actual load on the suspension. The center of gravity of an object is denoted by the circle/cross symbol. A typical motorcycle’s CG is located midway between the front and rear axles, and each wheel supports half the motorcycle’s weight (top). If more of the motorcycle’s mass is concentrated toward the front wheel (bottom), the center of gravity would correspondingly move forward. The front wheel would support more weight, the rear wheel less. The 250kg motorcycle and rider have a weight of 2452 Newtons or 250 kilograms-force. Typically, the “force” is dropped from the units and you can see where confusion begins to arise. To simplify matters, we will drop the “force” from the kilogram-force units and stick to kilograms when dealing with weight and weight transfer. While not technically correct, this makes it much easier when looking at data and trying to evaluate various scenarios as the motorcycle’s weight shifts around. Another important term to understand is center of gravity (CG), or center of mass. The CG is best visualized as the point at which an object can be supported such that the object is perfectly balanced. For example, you can support a heavy book on the tip of your finger if your finger is at the exact center of the book – its CG. While a book is a simple object and its CG is easily calculated, finding the CG of a more complicated shape such as a motorcycle is a difficult matter. The usefulness of the CG is that forces acting on a body can be considered to be acting on its CG, drastically simplifying calculations. The horizontal position of a motorcycle’s CG can be easily found by using two scales and finding how much of the motorcycle’s weight is on each wheel. Typically, the horizontal position of the center of gravity is midway between the wheels and Wf=Wr, giving a 50/50 weight bias. This is a very usable approximation for many calculations. 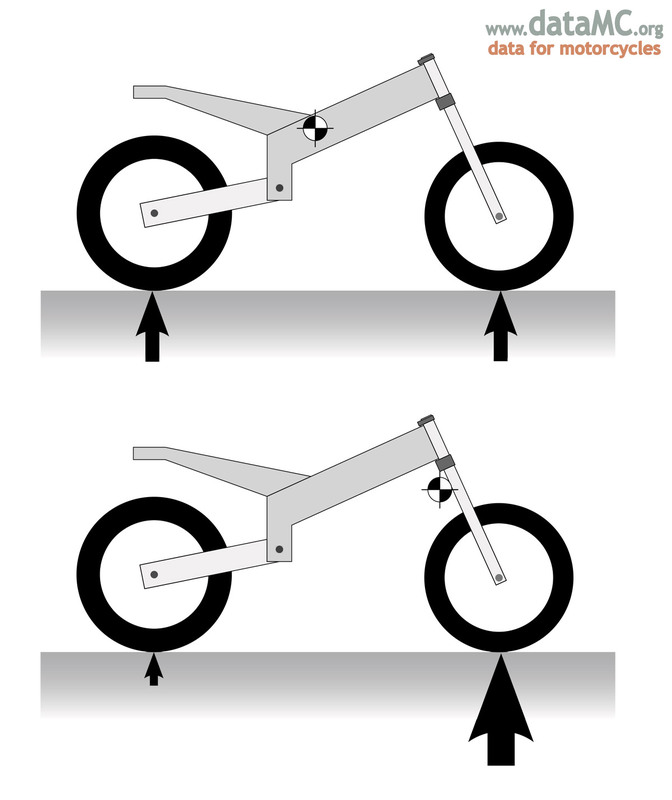 Finding the vertical position of the motorcycle’s center of gravity is more difficult, but in his book “The Racing Motorcycle: A Technical Guide for Constructors,” John Bradley outlines a method using two scales and again measuring weight on the front and rear wheels, but this time with one end of the motorcycle in an elevated position. By raising one end of the motorcycle, the vertical position of the CG can be determined from the weight on each wheel. A typical value for the vertical position of the CG and a usable approximation for many calculations is half of the wheelbase. For example, if your motorcycle’s wheelbase is 1400mm, a good approximation of the vertical CG position is 700mm. Note that we are interested in knowing the position of the center of gravity with the rider onboard, and these measurements must be taken with the rider in position, making it somewhat difficult. Also note that when the motorcycle is on-track, the rider moves around a considerable amount and the bulk of the motorcycle’s mass pitches about on the suspension. This means the CG’s vertical and horizontal positions are constantly changing. To take at least the suspension movement into account and its effect on CG position, it is sometimes useful to consider the CG as a point relative to the motorcycle’s swingarm pivot rather than the front or rear axle. This helps determine a more accurate position of the CG based on suspension travel, in turn giving more accurate data in some calculations. Now that we know the position of the motorcycle’s center of gravity, we can use this information to calculate the total weight or total load of the motorcycle (which takes into account the bike’s mass as well as load from lateral acceleration) and then split that into values for front and rear weight that take longitudinal acceleration into account.